Tonight marks the end to the month-long group of holidays and celebrations that began with Rosh Hashanah and ended with Simhat Torah. 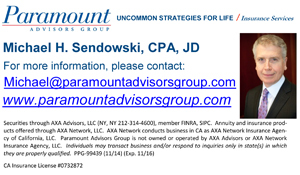 After many dinners and trying out a lot of new crowd pleasing recipes, it is time to share with everyone some of the party menus, fantastic fall recipes, and desserts I took to places we were invited. Tonight as the fog blows in thick from the ocean across my balcony facing west, I feel autumn has definitely arrived, at least in the evenings here. Peel onions, cut in half, and slice into thin circles. Separate onions into half rings. Pre-heat a large sauté pan, on medium-high heat, add olive oil, and add onions. Stir onions occasionally and season with salt and pepper. 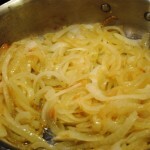 Once onions are sizzling, turn the heat down to medium-low, and let onions slowly caramelize. 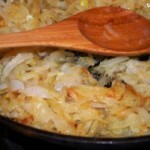 Onions should be light golden brown and will have reduced down in volume a great deal. Stir occasionally. 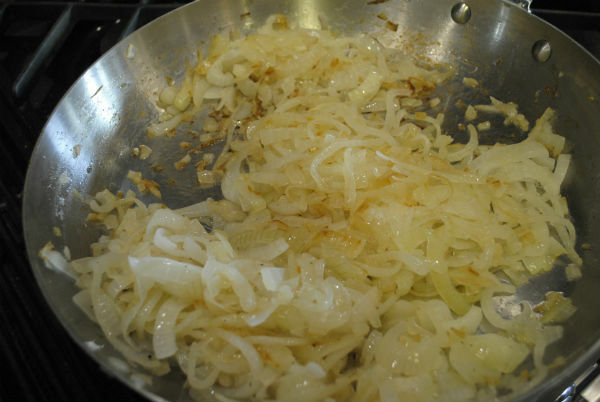 It will take about 40 minutes for onions to reach the right color. Set onions aside to cool. Pre-heat oven to 350° F. Place brisket in a large roasting pan, fat side up. Season brisket with salt and pepper. 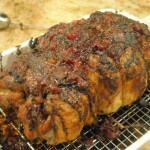 Pour crushed tomatoes over brisket and then, scatter garlic cloves, tamarind paste by spoonfuls, and brown sugar over top. Distribute dried porcini mushrooms in the four corners of the roasting pan. Scatter quartered mushrooms around the roasting pan. Spread cooled caramelized onions on top of brisket. Lastly pour in the red wine. 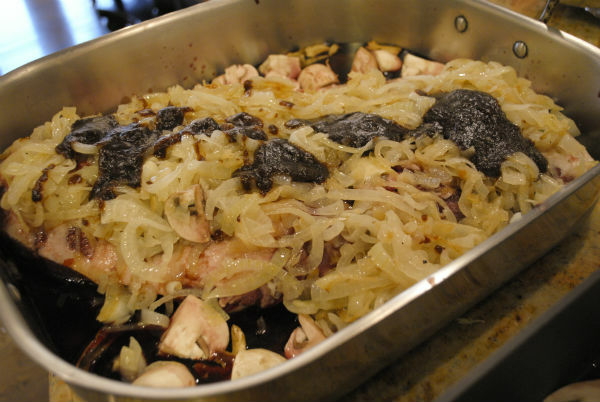 Cover the roasting pan with a large piece of heavy duty foil or a tight fitting lid. Seal the edges well so no steam can escape during the cooking time. Place brisket roasting pan in oven. 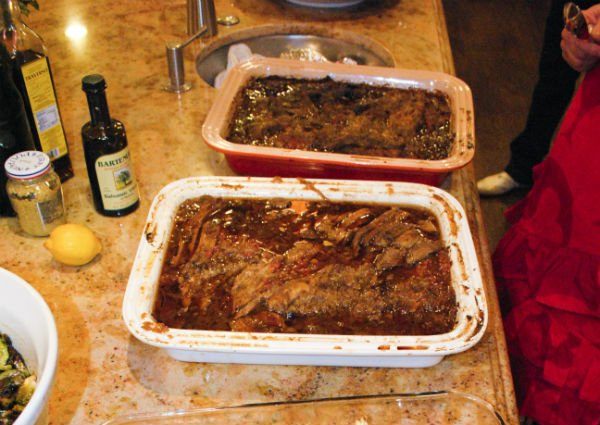 Turn oven heat down to 325º F and cook brisket for 3 hours until very tender. No peaking. Turn oven off and let brisket pan sit in the oven for another 1/ 2 hour. Carefully remove the pan from the oven without tipping because there will be a lot of juice. Let brisket cool for another hour and then, refrigerate. 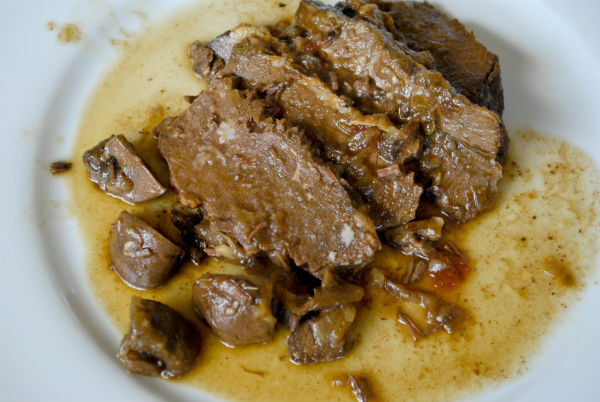 Refrigerate brisket overnight and the next day before reheating or freezing, skim fat from the congealed juice. Next, wipe onions from atop brisket into the pan juices, remove brisket from the roasting pan to a cutting board, and slice meat across the grain into thin slices, each one with a little ribbon of fat across the top. 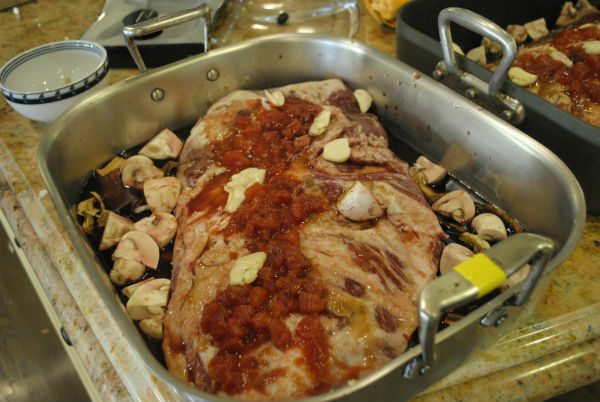 Replace sliced brisket back in roasting pan full of juice as if it were still whole. Spoon some pan juice over the top and cover tightly. 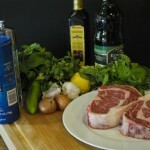 At this point it is ready to re-heat and serve or freeze for a week until your party. Brisket reheats easily at 325º F oven for 1/ 2 hour, covered. 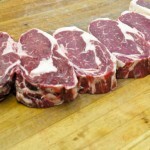 If it was frozen, make sure to defrost it first. I can tell by your beautiful pictures that your holidays were wonderful. 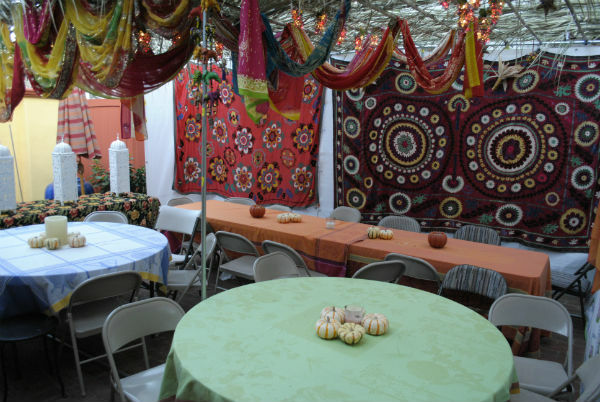 Your sukkah looks amazing. 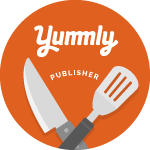 Looking forward to all the new recipes you will be sharing. 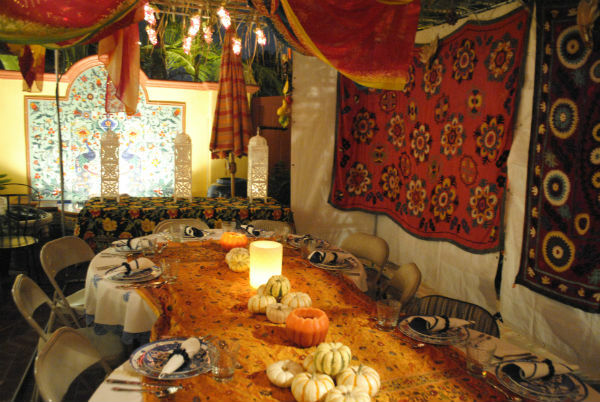 Love your Sukkah decor! 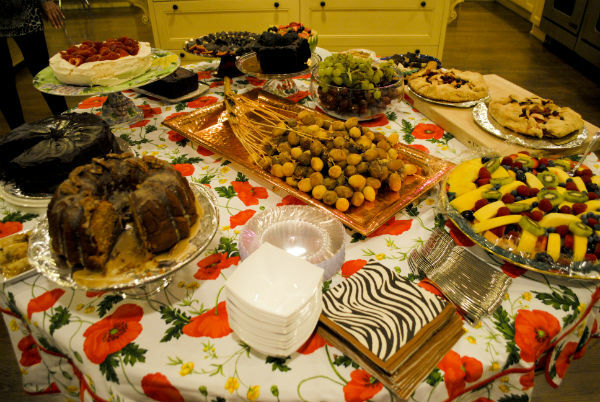 Check out tons of holiday tables on The Jewish Hostess!